Published: Jan. 3, 2019 at 08:56 p.m. The 2018 fantasy football season was one of the most difficult and challenging campaigns that fantasy fans have ever endured. One of the top stars in the league, Le’Veon Bell, decided to sit out the entire campaign over a contract dispute. Wish we would have known that in the summer! Several big-name players went down with injuries late in the season as well, and the year also saw the demise of the must-start fantasy quarterback. So without further ado, here are my 12th annual Guru Awards. 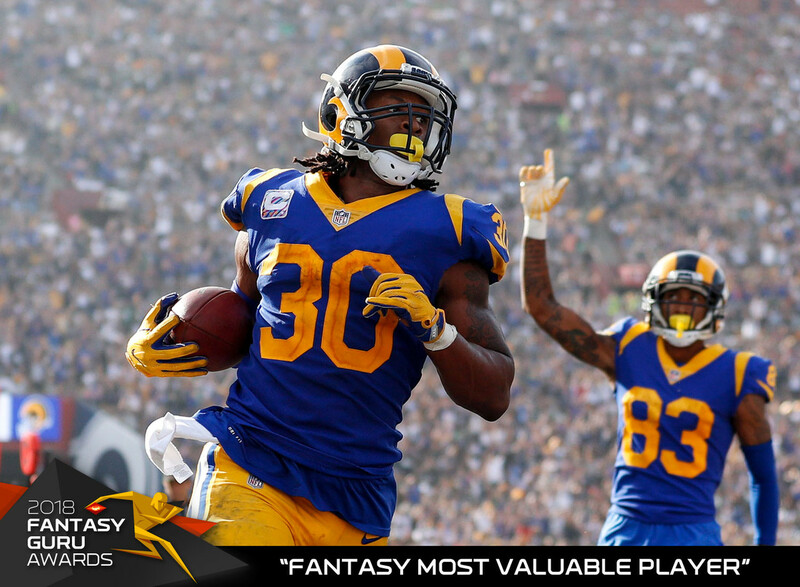 Gurley had another monster fantasy season in the stat sheets, finishing first in total touchdowns, third in rushing yards, seventh in receiving yards and third in fantasy points among running backs, and he did it while playing in 14 games. Gurley also finished with an average of 26.6 PPR points per game, which led all runners and ranked eighth all time. The Georgia product figures to be the top overall selection in most 2019 drafts. Mahomes was a popular sleeper/breakout candidate in 2018, but no one predicted that he would throw 50 touchdown passes and break the single-season record for fantasy points scored by a quarterback (417.08). Overall, Mahomes finished in the top five in points at the position eight times and was a top-10 signal-caller 13 times during the fantasy season. He's likely to be the lone quarterback picked in the top 50 in 2019 drafts. Woods has seen his stock rise in each of his last two seasons as a member of the Rams, including a 2018 campaign where he finished 11th in fantasy points among wide receivers in PPR leagues. The USC alum, who also produced career bests in catches, yards and touchdowns, was drafted in the 10th round based on NFL.com's average draft position data. Woods also scored at least 12 PPR points in all but one game this past season. Kittle, a 14th-round fantasy draft pick based on NFL.com's ADP totals, went on to have one of the best statistical seasons by a tight end … ever. He broke the NFL's single-season record for receiving yards at the position, putting up 1,377 while also finishing third in fantasy points. Kittle also nearly broke the single-game record for receiving yards at the position. He'll be a surefire top-five fantasy tight end in next year's drafts. This one is a no-brainer. The highly-touted runner out of Penn State met and exceeded expectations in the stat sheets, finishing first in fantasy points at the position while breaking Eric Dickerson's previous single-season record for points scored by a rookie runner. He also broke the record for rookie backs in receptions (91) and finished third in scrimmage yards (2,028). Barkley will be a cinch top-five overall pick in all 2019 drafts. There are several players who could fit here, but Fournette deserves the "award" for what was a lost season. He missed seven-plus games due to an injured hamstring, came back and performed well for a three-week stretch and was then suspended one game for getting into a fight in Week 12. Fournette also scored fewer than 10 fantasy points in two of his last three games. He'll be a massive risk-reward RB2 next season. White, the third Patriots running back picked in NFL.com drafts behind Rex Burkhead and Sony Michel, had a breakout campaign despite a 12th-round ADP. While he did hit a bit of a late-season rut, White still finished seventh in PPR points among running backs and scored 18-plus points six times while scoring in double digits in all but four games. The veteran, who also posted a career-high 87 catches, figures to be a RB2 in 2019 drafts. It seemed that everyone in the fantasy community (including myself) expected a Broncos running back to put up a breakout rookie season. Of course, no one thought it would be Lindsay. He quickly emerged past fellow rookie Royce Freeman on the Broncos depth chart and rode his success to a 1,000-yard year and a Pro Bowl appearance. Lindsay would finish the season injured, but he still ended up ranked 13th in points among backs. Luck missed the entire 2017 season due to an injured shoulder, and questions about his health in the preseason caused him to drop in 2018 fantasy drafts. He went on to finish fifth in fantasy points among quarterbacks, and only Mahomes threw for more touchdowns on the season. Luck also recorded 4,593 yards through the air, which is the second-most in his career. He'll be a locked and loaded top-five fantasy QB in 2019. The 2018 campaign saw several huge fantasy stat lines, including 14 40-plus point performances, but it was Cooper who had the biggest in PPR leagues. The former Raider went off against the Eagles in Week 14, posting 10 receptions, 217 yards, three touchdowns and a ridiculous 49.7 fantasy points. Ironically, the second-best fantasy line of the season came in the same week, as Derrick Henry has four scores and 47.8 fantasy points. Williams will be one of the unsung heroes of the 2018 fantasy playoffs, and he was a huge add and start for me once Spencer Ware went down with a bad hamstring. A virtual must-start running back over the final two weeks as Kansas City's featured back, Williams produced a combined 55.3 fantasy points in the fantasy semifinals and championship weeks. The former Dolphins runner helped a lot of fantasy fans take home a title. Streaming defenses has become very popular in fantasy leagues in recent seasons, and I thought I had a deep sleeper in the Raiders in Week 9. After all, their defense had a "great" matchup against a third-string quarterback named Nick Mullens who was making his first career start. Well, he made like Joe Montana with three touchdown passes and no turnovers. On the flip side, the Raiders defense put up minus-1 fantasy point.